Reindeer are just like dogs - except a lot bigger and with antlers. Yes, the fact that Murmansk doesn’t get any sunlight for 40 days during the polar night period might at first scare some people away. But, in fact, this unique experience attracts many tourists to the world's largest city (population 307,000 people) north of the Arctic Circle. Unlike many other places beyond the Arctic Circle, Murmansk on the Kola Peninsula is an increasingly popular choice for Russian and foreign tourists alike thanks to the great connections from St. Petersburg (1-hour flight, several flights daily) and Moscow (2-hour flight, several flights daily). The city’s infrastructure and decent selection of hotels and restaurants make it one of the most comfortable cities in some of the most uncomfortable weather conditions in the world. And, of course, the fierce but beautiful winter in the tundra provides a large selection of thrilling and unforgettable experiences! With all this in mind, Murmansk seemed like the perfect long weekend destination in the winter so RBTH’s Social Media Director travelled there and documented all her incredible, action-packed experiences in these “Polar Diaries”. We landed in Murmansk around 10 a.m. and it was still pretty much pitch black. From everything I read beforehand, for some reason I got the impression that it never gets light at all during the 40 days of polar winter night period and that the temperatures are way below freezing. By the time we got our luggage and grabbed a coffee at cafe “Yunost’”, the not so large airport’s only cafe, the sky was actually starting to get somewhat light and the thermometer was showing only -2 Celsius! Our tour guide Kirill, one of the founders of NordTours, picked us up shortly after we collected our luggage and my first question to him was, naturally, “why is it light and not insanely freezing?!”. It turns out that it’s a common misconception many people have about the polar night in the winter: it’s not that it never gets light - it’s just that there is no sun in the sky during that period. You can have the clearest blue sky - much like we did by the time we set off from the airport - but you will not see the sun between approximately December 1st and January 10th. As for the “warm” temperatures, Kirill explained that the winters are becoming more and more mild like everywhere else due to changing climate trends, although it’s not unheard of getting -20 Celsius. After clearing all that up once and for all, Kirill gave us a rundown of what we could expect to do on our first day on the Kola Peninsula. First up was a trip to a traditional Sami village, where we would find out all about the way of life of the Kola Peninsula’s indigenous people. Traditionally, the primary occupation of the Saami has always been reindeer farming but they are also very skilled fishermen and hunters because they know the tundra like the back of their hand. Currently, only about 10 percent of the Sami are connected to reindeer herding, providing them with meat, fur and transportation. Roughly 2,800 Sami people across Norway, Finland, Russia and Sweden are actively involved in herding on a full-time basis. Like many indigenous people of the Arctic and indeed the world, the younger generations of the Sami people are becoming increasingly urbanized and their traditional way of life is starting to disappear. There are now approximately 2,000 Sami living on the Kola Peninsula and anywhere between 80,000 and 135,000 in the entire Nordic region of Norway, Sweden, Finland and Russia. Population estimates are difficult to measure precisely due to the cultural assimilation of the Sami people that had occurred in the four countries over the centuries. Svetlana, the village matriarch, met us at the entrance to her village with a huge smile on her face and the distinctively colorful traditional Lappish coat over her back. Although everyone was hungry and cold and the feast was awaiting us inside the traditional Sami dwelling, it was wise to use the very limited number of daylight hours to get up close and personal with the furry members of any Sami tribe - the reindeer! 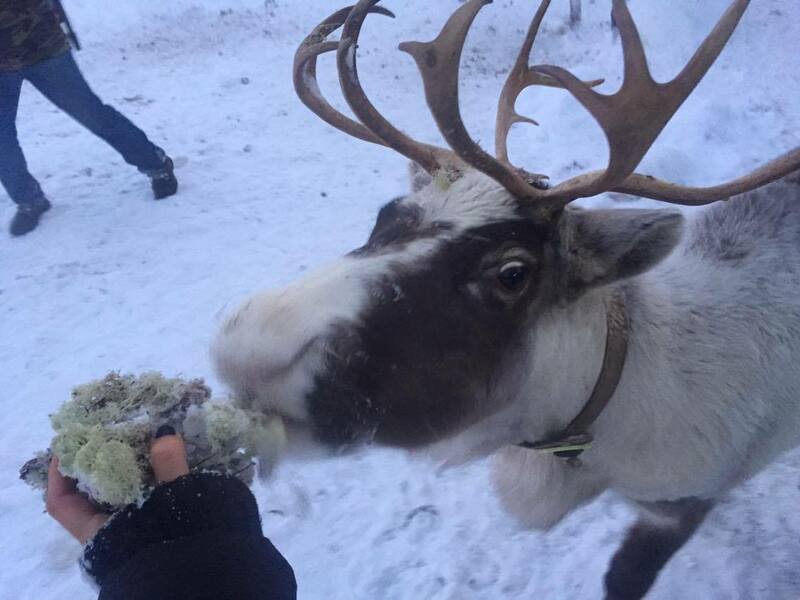 Reindeer are just like dogs - except a lot bigger and with antlers. They get incredibly excited when someone approaches their enclosure, especially if that someone is holding a huge chunk of moss in their hands. Despite their size, these are very gentle and smart creatures that carefully nibble the moss from your hands without biting you. But because of their excitement and inability to stand still for two seconds, it was almost impossible to get a decent, goofy selfie with them! The darkness started to approach rapidly (it was about 2pm!) so it was time to go inside and enjoy a real Sami feast. Svetlana prepared some delicious salmon soup and it was impossible not to ask for seconds. While we were enjoying our lunch, she entertained and educated us with interesting stories about the past and the present days of the Sami people, their legends and their traditions. She also explained why in Sami culture, the villages are traditionally matriarchic. Ladies, listen up! Since the tundra is one of the most inhospitable environments on the planet, a woman always needed a back-up, so to speak. One husband went out hunting, the other fishing and the third herding reindeer. If one of them never came back, the family would not lose their sole provider and would always have support. Therefore, a traditional Sami woman could have up to three husbands. The problem nowadays is finding three men that would agree to such an arrangement! Before we could move on to tea and pie, Svetlana guided us into another tent. The walls were covered with reindeer hides to keep it well insulated, a fire was burning in the middle and Nadezhda, a real Sami shaman (or “noid” as they are referred to here), was waiting for us inside. Nadezhda explained traditional Sami beliefs to us, played several instruments and, as part of the grand finale, got us dancing and singing with the spirits! Before we said our goodbyes to Svetlana, it was time for that lingonberry pie that I had my eyes on since setting foot in the village. Berries have been and still are an important food in this region because other kinds of vegetables are traditionally not available during the long winters. The pie tasted as good as it looked and I crave it every single time I have a cup of hot tea. The ride to Murmansk didn’t take very long but in just one hour, you go from being in the vast nothingness of the tundra to a fairly bustling city with the population of almost all of Iceland! It felt almost like time travel. The next thing on the first day’s agenda was a bit of R&R before embarking on the hunt for the famed yet elusive Aurora Borealis, something that has really started increasing the number of tourists coming to the region from other parts of Russia and abroad in recent years. There are many factors that come into play when embarking on the “hunt”. First and foremost, it’s the weather, which is highly unstable in this part of the world. The guys at the travel agency were constantly monitoring the conditions that day and looked for the optimal place to take us and the other tourists. This could have been anywhere between 30 and 150 kilometers from Murmansk - it all depends on where the skies are clear that night. Seeing the Northern Lights in Murmansk itself is highly unlikely due to light pollution. Unfortunately for us, the tour guides came to the conclusion that on this day the chances were essentially non-existent due to thick cloud cover and snow. Nonetheless, after about 8pm we set off from Murmansk in the direction of Teriberka because as they say, hope dies last! We drove and waited for hours but Kirill and Sergey (the other tour guide) treated us to tea, cookies and facts about the region and about their business as we kept driving further and further away from civilization. By the time decided to give up it was already 1 a.m. and we had almost reached Teriberka. I joked that we might as well sleep in the car as this town was on our itinerary for the following day. Jokes aside, a blizzard was starting to hit hard and if we didn’t turn back, we may as well have had to sleep in the car because the tiny tundra road would be covered by a mountain of snow. But first, a relaxed tea session in the car. As we found out on this trip to the Kola Peninsula, tea is above all else and this ritual cannot be rushed, not even at the risk of being snowed in. By the time we got to our accommodation, we had been awake for almost 24 hours so falling asleep was the easiest thing in the world.